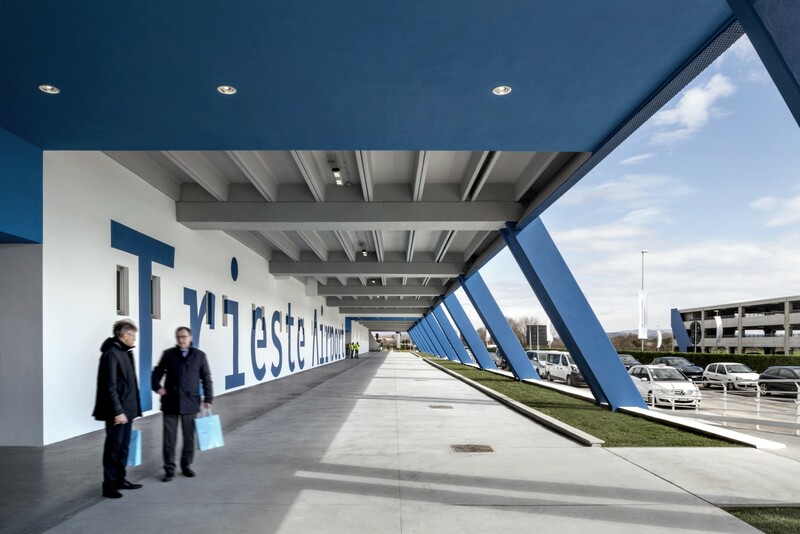 The pedestrian walkway and new entrance designed by Lombardini22’s studio FUD for Trieste airport are part of a wider-ranging programme of coordinated visual communications relaunching the new transportation hub in Friuli Venezia Giulia. FUD, the Lombardini22 Physical Branding and Communication Design brand, has come up with a coordinated visual communications strategy and project for Ronchi dei Legionari Airport in Trieste, now renamed simply Trieste Airport. The programme for relaunching the airport entailed a new design for the departures area with a pedestrian walkway and a new entrance. 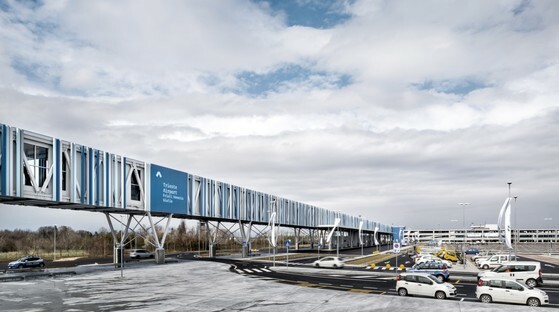 With the Trieste Airport intermodal platform that recently opened to the public, Friuli Venezia Giulia now has an important new transportation hub combining a renewed airport terminal, a railway station, a bus station, a new multi-storey parking garage and a ground-level parking lot with a complex system of internal roads divided into two circuits to optimise accessibility and public and private flows. The symbol of Trieste Airport, a sort of upside-down V, is manipulated and extruded by the architects to become a new compositional element in the walkway. This is the basic module on which the system of glass and steel elements constituting the walkway is built, alternating colours and hues of white and blue, reflecting the rhythm of the division of agricultural land around the infrastructure. 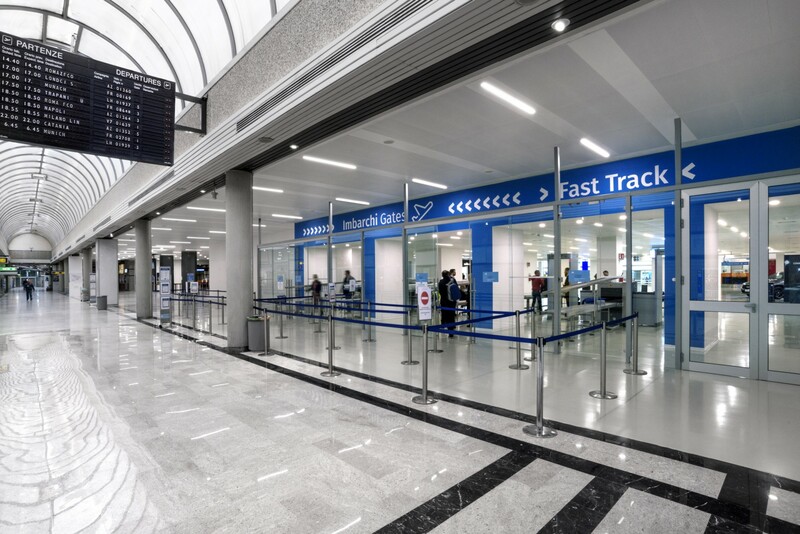 Blue is the prevailing colour, characterising the airport’s new image in the interiors and signage, clearly visible in the welcome messages and directions at the new entrance. Lombardini22/FUD’s project has given the airport a new easily recognisable, high-impact entrance. On the façade, a new platform consistent with the site’s overall image ensures that passengers instantly recognise the main airport building. Lombardini22/FUD also modernised the airport interiors. The passenger is the focus of the new design, the target of FUD’s effective and intuitive communications, using a clear, immediate vocabulary to help people find their way around using pleasing contemporary solutions. The architects designed all aspects of the interior spaces, from the waiting areas to the restaurants, from the departures lounge to the boarding gates and the arrivals area. Their work was not limited to modernisation of the spaces, but also included simplification and rationalisation of passenger routes. The airport is more than a terminal; it is a place full of symbols, information and messages. The rationalisation and organisation of the flow of information and messages is an essential aspect, making communications both pleasing and immediate for passengers in a hurry. FUD designed coordinated visual communications including naming, slogan, logo, signage, and colour palette; symbolic, practical graphics consistent with the facility’s identity, in which every little detail is clear, visible and effective.